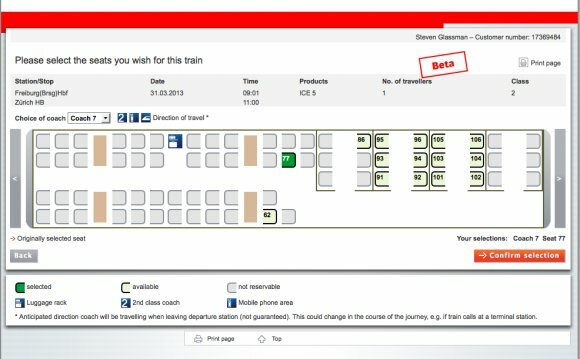 It's possible to make reservations for German high-speed and night trains on the Deutsche Bahn website and then print them out. You can make reservations up to 3 months in advance. You'll need a reservation for sleeping accommodation on most night trains. Reservations are optional for ICE trains, but during peak season (May - September) and public holidays, we recommend making a reservation in order to guarantee yourself a seat. Please keep in mind that it's not possible to make online reservations for international day trains to and from Germany. For those reservations we advise you to contact the Deutsche Bahn call center (+49 180 699 6633) or go to an international ticket office at larger German train stations. Make reservations for German night trains on the Deutsche Bahn website. Click on ‘Purchase’ or ‘Check availability’ (ignore the prices) for the train of your choice. At the bottom of the page click on ‘Book supplement only’. On the next page select ‘Pass offer’. You can then choose the type of seating or sleeping accommodation you want. Prices are shown for the different options. You can choose online tickets, which you can print. It's also possible to have reservation tickets sent by mail for an additional charge. A reservation costs €4 (2nd class) or €5 (1st class) per person. Fill in your start and destination city, the journey date and the number of travelers and tick the 'Reservation for seat only (no ticket)' box. Now you will see various travel options. Choose your desired time and click on Reservation. On the next page, you can choose which kind of seat you want. Choose your seat and click on Proceed. Select the option 'I wish to book without logging in'. On the next page, you can choose which kind of seat you want. Choose your seat and click on Proceed. Select the option 'I wish to book without logging in'. Fill in your personal details and pay securely with your credit card. After the payment, you can print your reservation(s).